No matter how small your contribution – every little helps towards improving the welfare and saving the lives of racing greyhounds – the most exploited breed of dog and companion animal in Britain today. 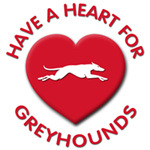 Join a greyhound protection group or ‘Like’ Greyt Exploitations Facebook page to keep up to date with every day events. Tell friends – family or co-workers about the exploitation of greyhounds by sharing our website. If possible – please send a donation to help fund educational and awareness campaigns – rescue – research and investigations or make a monthly donation. If you would like any other help or advice – please contact us – we will be more than pleased to hear from you.